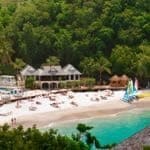 There are plenty of gorgeous hotels on the beaches of St Lucia where you’ll be tempted to stay put. But don’t get too comfortable – this is a spectacular island crying out to be explored, from its glistening forests and volcanic peaks to its sleepy fishing villages and lush plantations. St Lucia’s reputation as the Caribbean’s most scenic island is well founded. In addition to palm-fringed beaches and lush rainforest, it boasts a rich culture infused with Creole, French and African influences. Don’t miss a visit to the iconic twin peaks – the Pitons – designated a UNESCO World Heritage Site. Nearby are the Diamond Waterfalls, set in tropical gardens, plus the world’s only drive-in volcano. Adventurers can go diving, zipwire across the rainforest canopy, take a jeep safari tour and a helicopter flight. There is golf at St Lucia Golf & Country Club and the chance to experience the island’s unique culture at Fond Latisab Creole Park. When it comes to accommodation, we’ve got all options covered. 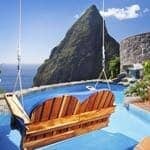 St Lucia has a wide choice of all-inclusive hotels to suit most budgets and tastes. If you’re looking for an adults-only escape, we have selected the best on offer and St Lucia is home to some superb family resorts. 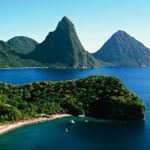 Of all the Caribbean islands, St Lucia has one of the most diverse selections of luxury hotels and it’s consistently one of the most popular choices for honeymoons – we rate it as one of the most romantic places on earth. Here are a few examples of specific resorts which our team recommends. Set in 145 acres of tropical park, the all-inclusive Coconut Bay Beach Resort even has its own water park, making it a popular choice for families. There’s a family wing and one for adults only and we love the wide choice of restaurants, all included in the price. For something really special, Serenity at Coconut Bay is an adults-only hideaway with just 36 suites, each of which has a private plunge pool and butler service. 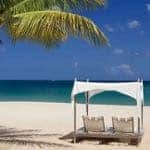 All the facilities of the adjacent Coconut Bay Beach Resort are available but you might find it hard to tear yourselves away from the tranquility and luxury of this all-inclusive gem. The boutique-style Rendezvous is for couples only and has all the ingredients for a romantic getaway. Relax by the pool, on the beach or in the lazy river and indulge yourselves in the spa. If you want to mix things up a bit, we offer multi-centre holidays combining St Lucia with other Caribbean islands and New York, for example. With daily non-stop flights from the UK, St Lucia is easy to reach too. Click here for more about our holidays in St Lucia.